If you have an extra bathroom to spare for your kids, why not design the space to be fun and inviting for them as well? 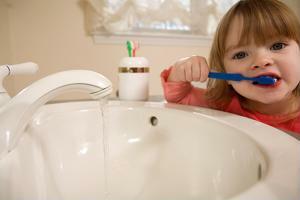 Making your kids comfortable in the space will make hygienic tasks easier both for you and for them. According to TLC, having a separate bathroom for your little ones is a luxury, so you might as well go all out if you're planning on renovating. Children always react positively to bright colors, so why not ask them what their favorite colors are and get the shade painted on the wall? If you're the creative kind, you can even adorn the room with a mural to support a theme that your kids might enjoy. Do your little ones like the beach? Paint colorful palm trees and playful monkeys on the wall - if you don't like it, you can just easily paint over it. Of course, it's not just the look of the bathroom that you have to think about - you also have to make it convenient for your children. If they can't reach the bathroom vanity, purchase a step stool so they can safely brush their teeth and rinse afterwards.